Do you still remember the feeling of receiving your first work permit? Ecstatic. Relieved. Anxious. You could have run if only the small-yet-heavy luggage is not slowing you down. After sitting or reclining on the plane seat for hours and finding your way in a huge airport, you made it to your next flight. Just in time. With open work permit you can work in other fields apart from caregiving. You can go back to the career you left behind in the Philippines or pursue the career you always dream of. It’s all up to you. For now let’s focus in getting an open work permit. So when is the right time to apply for open work permit for live-in Caregivers? The application for open work permit can be submitted together with the application for permanent resident status which requires 24 months or 3,900 hours of full-time employment. It does make sense to do all the paper works and not worry losing either one. Do not imagine yet the piles of papers. Concentrate on how to apply for open work permit for caregivers by gathering all the forms for serious reading. Download the latest Adobe Reader X1. Installing McAfee Security Scan Plus is optional. Uncheck the box if you don’t want to install McAfee. To quickly save the form, right click the link and choose “Save Link As…” option. Before you move on DO NOT MISS to read the changes in Canada’s Caregiver Program that started on November 30, 2014. Be informed. On Citizenship and Immigration Canada website you can see all forms including the Instruction Guide. DOWNLOAD THE APPLICATION PACKAGE. Print all the forms and fill out using red and black pens. Don’t forget the correction liquid. (Feeling like a student again?) It can get messy as you write things down—with every recollection and correction. Read the Instruction Guide (IMM 5553) before filling out the form. Validate and save the forms once you’re done. Do not worry; you can still edit and save the changes. After validation, an additional page with bar code is added to the form (IMM 5710). 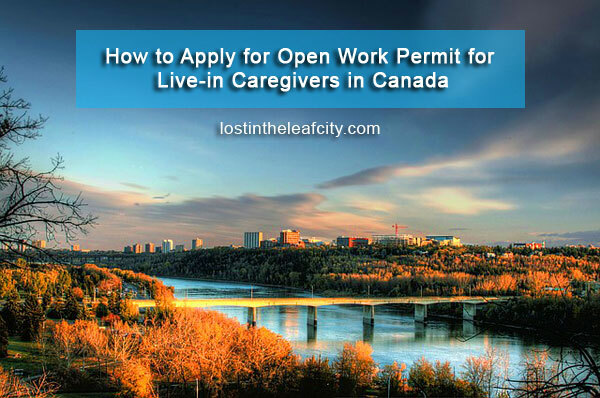 Write “Open Work Permit – Live-in Caregiver“ on the top of the form. If you have a question on how to apply for open work permit for live-in caregivers, it is always best to get first-hand information. You can call the Citizenship Immigration Canada for all your queries. Be patient though. Stay on the line since it may take some time for your turn depending on the time of the day and number of callers. Once you completed the application forms it’s time to pay $155.00 (renewal or initial work permit) and $100.00 (since February 21, 2015 for the Open Work Permit Holder fee). You can pay online. It is the fastest and convenient way since you can quickly print the receipt. You also have the option of saving the receipt as PDF or sending it to your email. You can pay through a financial institution in Canada. First, you have to request for original receipt online. The receipt will be mailed to you. Second, use the receipt in paying the bank or wire service. You will get a copy to be sent with the application. You’ve done your part at this point. (I’m sure of that.) There are just so much excitement and nervousness that are bothering you at the same time. Treat this as “I’m almost done” anxiety. Ask someone (you trust) to review your application form. Errors are often spotted by others who haven’t spent a great deal of time dealing with paper work—and pressure. Later on you’ll feel (and sleep) better. What’s Next After the Submission of Complete Application? After all the hard work comes the best part: relaxing–and waiting. Feel the same emotion at the time you first had a work permit—while not reliving the anxiety of the next flight. How are you doing with your application? If you have any questions let me know by commenting. And don’t forget to share some tips. Hi Ms Carolyn, I am in the process of gathering requirements for my PR application. I entered Canada year 2016 working as in-home child provider. Can I apply using the old pathway (open work permit & pr application)? I am confused right now. They say I should apply under new pathway because I was approved as a worker after 2014 wherein the new pathways has been implemented. And if you were to ask should I go for new pathway? Kindly help me on this matter. I need clarifications and suggestions. Thank you! God bless. The only way to be sure if you can apply through the old pathway (which I’m not sure if it still exist) is by calling the immigration. Sure, you can get information from anyone but listen with caution. Don’t blindly follow any one’s advice except from a first-hand source such as the immigration. And about the old pathway, isn’t the live-in caregiver program was already abolished. I hope you get the clarity your seeking so you can start gathering documents for your application. Hi Carolyn, it’s me again. I used to ask about the OWP forms in previous comment; and it was used for my work permit extension only. Now is the time for me to apply for PR and OWP at the same time, however, I’m still wondering about the detailed of the application form that I would like to ask. 1. In the first part of “IMM 5710 – Application to Change Conditions, Extend my Stay or Remain in Canada as a Worker” form, question No.3 “I am applying for one of the following”, which answer should I choose? 2. In the “Details of intended work in Canada” section, I chose the type of work permit that I am applying for is Open Work Permit. Do I need to fill in the details of my prospective employer as exactly as I used to apply for the current work permit extension? Because there is no guarantee about whom I’m gonna work for, as well as the LMIA in the future right? 3. In the “Background information” section, question 2c) “Have you ever previously applied to enter or remain in Canada?”, my answer is Yes, because “I came to Canada in Sep 2016 under the Caregiver work permit, and have been working in Canada with the same employer since then. This was the only time.” What do you think about my answer? The only way to answer your question Thu Ha is to find out who is your employer is? Will you continue working with the same employer that you have right now or do you have a new employer. It would be much easier if you would still work for your current employer while the application for OWP is being processed, once you get the permit then you can work anywhere. The only question I can answer clearly is no.3; you are correct. I apologize for not being much of help but the caregiver program is getting way more complicated with the addition of two new paths then the impending end of the program. Who knows what will the next policy be. When in doubt call the immigration. I called several times although I dislike waiting for 15 minutes or more; it’s worth it anyway. And gather all the questions you have in mind before making the call. Good luck Thu Ha. I hope you’ll get your PR and OWP as soon as possible. Thanks Carolyn for your advice and wishes. Yah I’m still working with my current employer; actually they helped me to renew the LMIA so that I could apply for WP extension last August. Now is the time for me to apply for PR and OWP at the same time. That’s why I’m so concerned about whether I should mention them again or not. Anyway I’ll try to call the IRCC seeking for their help as you suggested. Which check-boxes should I check in? I just got the new LMIA for a caregiver for children pathway from my current same employer, and until the end of July 2018 I’ll complete more than 3900 working hours as required; unfortunately my status will be invalid in the end of August, so could I submit the application for both OWP and PR before July or do I have to wait? And is the form of extending my stay considered to be the same as an application for OWP or not? You have to choose “a” (work permit with the same employer). As soon as you meet the requirements for OWP and PR, submit the application at the same time. The the form for “extending my stay” in your case is the application for OWP. Many workers use the same form and not only caregivers. Thank you so much, Carolyn! I feel so relieved knowing about it. Your blog is so helpful for us caregivers. Thanks for all the details. God bless you! Hello Carolyn! I just have a question regarding my application. My work permit (3 years) will expire next year, I’m about to apply for the Old Pathway. In one of the forms, it has a question, the current country of residence FROM the date I came here in Canada up TO when? I’m confused what date I’m gonna put. Is it the current date or the date my work permit indicated? Thank you. Here’s my thought: From = the day of arrival in Canada. To = the validity date of work permit. Hi! I am on the process of gathering all the requirements for my Open Work Application but I am confuse on the fees. I tried the online application, it says I need to pay Work Permit Renewal $155 + $100 Open Work Permit, it confuses me because my friend said I only need to pay the $100 then I read your blog, it’s clear to me now. Your welcome Maria. Writing for caregivers is something that I’ll continue doing and you can learn about it on the Caregivers in Canada page. Here you’ll learn the journey of a caregiver and what lies ahead. Let me know if you have question that I can answer and write about.